Born in rural Cambodia, Lork is the 5th child of six siblings. His mother died when he was 13 years old, leaving his father – a farmer who has struggled physically since losing his left arm during the Khmer Rouge’s reign of terror – to raise the children. After remarrying, Lork’s father started a new family. As is common in Cambodia, the children of the first wife or husband are often not welcome in the new family. Cast out, Lork and his siblings struggled to survive and were forced to leave their homeland to find work so that they could not only live but also contin ue their studies, which, even at their tender ages, they knew was important for their futures. As a 9th grader, Lork remembers being asked: What is your dream? Without hesitation he declared: “I want to be a doctor”. He successfully passed his lower school exams but had no way of being able to continue to study at high school. As he had heard there wa s a good government school in Siem Reap, Lork decided to move to the city, as he was sure he could find employment to support himself while he studied in upper school. Fortunately, he found a job where he could work half a day and continue his high school studies in the afternoons. Lork was alone during this time and was lonely without his siblings around him, but he knew the sacrifice would be worth it if he studied hard and strived towards his dream to study medicine. Due to his diligence he was rewarded by coming 1st in his class and being named one of the top students for mathematics and chemistry in his province. Two months later he passed the national examination for medical school entrance in Phnom Penh. With more than 4000 applicants and only 360 places to be filled, Lork’s selection meant his dream was about to begin. 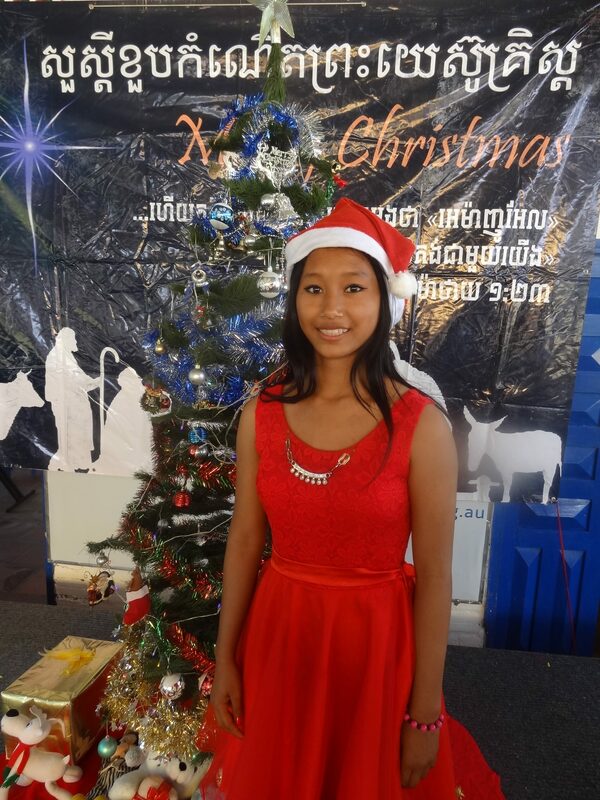 In January 2016, Lork was awarded an Awareness Cambodia scholarship, which provides his tuition fees and a nurturing home at Graduation House. Today Lork is in his 7th year studying medicine at the University of Health Science in Phnom Penh and is incredibly grateful to Awareness Cambodia for making this dream come true. Loved by all, Lork is a delight to have around Graduation House, where he is thriving. Instilled with a desire to help others and ‘pay it forward’, he volunteers at local hospitals and is always helping the other students with their studies. Lork has just been accepted into a medical specialty program and will continue his scholarship with Awareness Cambodia. Sponsored by Awareness Cambodia since 2000, Somphos and Sokhua were residents and students of the Sunshine House and Graduation House projects. Today they are university graduates, married and the proud parents of an adorable toddler named Galvin. Somphos came to Sunshine House at age 10 after her father passed away. With both his parents deceased, Sokhua joined the Sunshine House family as a 7-year-old. Somphos and Sokhua transitioned through our Child Development programs – Sunshine House to House of Progress to Graduation House – and in 2010 took up university studies. Somphos studied Economics and Sokhua studied Architecture. After graduating with their qualifications, they married in October 2015. Sokhua and Somphos are grateful to Awareness Cambodia for the care, support and sponsorship that helped them realise their dreams – good jobs and a loving family. We couldn’t be more proud of what they have achieved and hopeful for what lies ahead for their young family. We would love for you to partner with us for this great cause! For each $15 you donate we can buy a backpack, fill it with school supplies and give educational tools to the rural poor. If your school, church, business or organisation would like to be involved, we would love to hear from you (the donation may be tax deductible). In recognition of your support, your logo is displayed on the school bags your generosity enabled us to purchase. You’ll also receive an appreciation certificate together with photos taken on the day when the bags you contributed are distributed at a school. Case 4 Change 2018 – partner with us to help positively impact the future of these children through the power of education. Our heartfelt thanks to our donors – you made it possible for A Case for Change to distribute 600 backpacks this year. For every $15 donated we are able to purchase a school backpack, fill it with school supplies and place your school or business logo on the front in recognition of your support of our important program. At Awareness Cambodia we are passionate about education and the life-changing opportunities that learning affords to children everywhere. We believe education is a powerful and basic human right that enables children to break the cycle of poverty and inequity which can lead to trafficking, gender-based violence and other human rights abuses. We invite your school, church or business to join us by becoming a part of A Case for Change. When you fundraise for A Case for Change you are helping schoolkids in Cambodia’s poorest rural province, Kompong Speu, get the education they deserve. Each school backpack that you provide is helping to re-write Cambodia’s future! It’s simple for your school, church or business to get involved in 2018: Just email Kim (kim@awarecam.org.au) and we will get an information pack to you. Then for each $15 you donate, we will purchase a backpack, put your logo on it, fill it with school supplies and deliver the backpack to a school next July. It’s that easy. Your gift will empower children to realise their dreams!